There is nothing worse than bruised and wasted fruit, so if you like the idea of having fruits and veggies on the counter, but not the space then check out this under cabinet hammock. 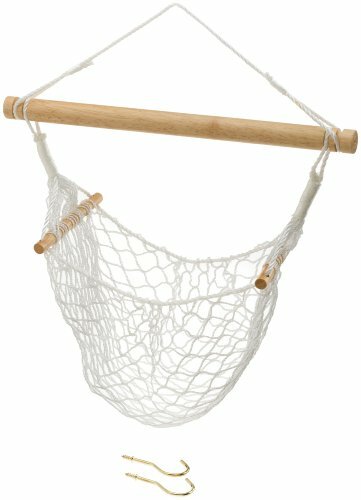 You can get all kinds of baskets and bowls that can sit on your counter to keep foods in, but if counter space is at a premium and you find that the fruit is going off or being bruised quite quickly then using a gentle hammock instead of a hard bowl or basket would help to support the foods and keep them fresh longer. Many people resort to keeping them in the fridge simply because they don’t have the room, and yet apples and tomatoes especially taste their best at room temperature. If you simply do not have the counter space to store them in, then consider getting a hammock to support them off of the counter. The hammock secures quickly to the underside of the upper cabinets with two hooks that are included. This way you can enjoy the flavours of room temperature fresh foods such as apples, tomatoes, bananas and more, they are elevated off the counter so that they don’t get bumped around and also leaves you with a clear counter top. Which in a small space can be the perfect solution. The complete air circulation that the hammock offers helps to keep the fruit and veggies fresh and ready to eat. They do not spoil as quickly and will remind you to eat them each day as you will see them at eye level, rather than rotting away in the fridge or in some hard basket or bowl. It is good looking too. With many kitchens getting smaller or people downsizing to smaller spaces, utilizing all the free space becomes important. You can easily clutter up a kitchen with all the gadgets we use on a daily basis. But the idea of hiding everything away in the cabinets or even the fridge is not really the answer either, so by utilizing the space just below the top cabinets you can get a lot of items off the counter top and free up more work area. You can now get many small appliances such as coffee pots, can openers, k-cup holders and more that will secure nicely to the bottom of the upper cabinets, allowing you to use all the space in your kitchen for actual food preparation! Clutter can be a real problem with all of the conveniences we like to use. So instead of trying to make the kitchen bigger, maybe try utilizing all the space you can and make your kitchen user friendly. Using a food hammock is just another great idea to keep the food fresh with less bruising and off the counter. You can get these at most kitchen supply stores and some specialty kitchen shops but you can also get an under cabinet fruit and veggie hammock online at sites such as Amazon. Shopping online is a great way to see a much larger assortment and in most cases get it delivered right to your door. You know you are supposed to eat lots of fruits and vegetables each day, maybe if you have them in one of these hammocks suspended in your kitchen you will see them and think to eat them. this will give you more counter space.